I’ve started the process of emptying my basement. There is still stuff there, that I’ve build during my apprenticeship years with the company then called “Nixdorf Computers”, basically my computer roots from more than 30 years ago. To remember everything I photographed every note worthy item. Then I I will junk everything. 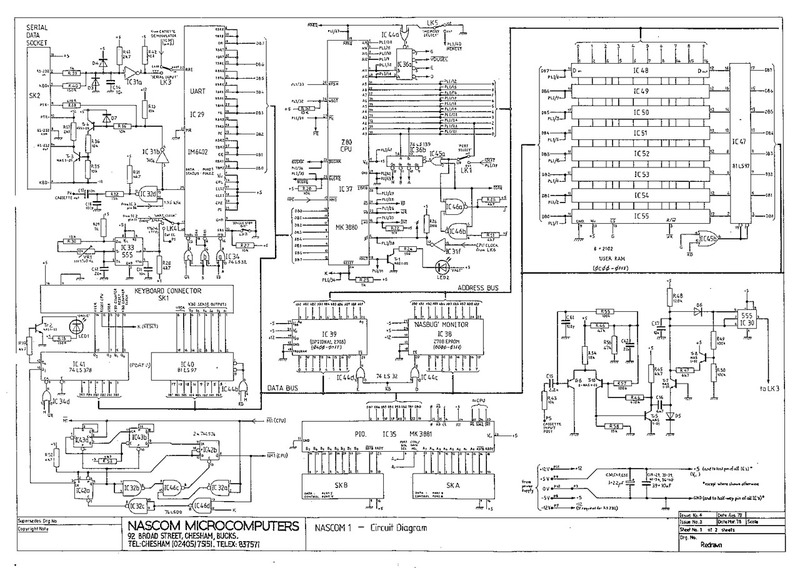 My computer history started with a NASCOM 1 single board computer using the Z80 microprocessor. According to Internet wisdom, this board was designed in 1977 and then sold from 1978 onwards. The size was about a single A4 paper. I bought my system used from a friend of a friend in early 1981. There is a TheRegister article from 2013 “UK micro pioneer Chris Shelton: The mind behind the Nascom 1” about the creator of the NASCOM. On the second page of the article there is a schematic how the individual components were connected, just as I remember it. Here are two more links of pictures of the NASCOM 1 (1 & 2). There is even a blog about “Working NASCOM Microcomputers in the UK”. I distinctly remember the static RAM chips 2102 with an organisation of 1024 x 1bit. Of these 1k roughly a little more than 800 bytes were left for user programs, which needed to be saved/restored to and from a cassette tape. A 2708 EPROM (1k x 8) contained the NASBUG monitor program. One of my first enhancements was the extensions of the RAM size by doubling it using the 2114 static RAM chips. These chips had a 1024 x 4bit organisation. The original NASCOM board is long gone, however this next enhancement still exists. This contraption replaced the Z80 CPU on the main board and the Z80 CPU moved the 40 pin socket on this extension. The 74LS244 TTL chips are one directional bus driver chips mostly located in the address and other signal lines of the CPU. The 74LS245 TTL chip is a bi-directional bus driver, sitting in the data lines of the CPU. With this extension the CPU lines are low impedance enough that is allowed me to connect the following bus card to the NASCOM motherboard. I gradually moved the NASCOM to a number of boards consisting of cards in 100 x 160mm in size. I used a design from the electronics magazine Elektor, which I etched myself.